The world's food production could feed 12 to 14 billion people – nearly double the current population of 7.5 billion. But 800 million – almost one in nine – still go hungry. The majority of the poor live on, and from, the land. They are economically weak, politically marginalized, and their survival is constantly under threat. Despite this, it is the poorest who fight tirelessly against land grabbing, environmental destruction and unjust prices. Various movements of smallholders and landless people have emerged in developing countries in recent years. Many have their origins in indigenous communities. They fight for land rights against soybean barons, palm oil exporters and mining companies, and against declining prices for their products. But governments often prefer lower prices, powered by cheap imports, because they benefit the urban poor. City-dwellers are more important to those in power than the residents of remote rural areas. The scarcer and more valuable land and water are for farming, the more violent the struggle. In Latin America, several land rights activists have been killed in recent years. Governments in Ethiopia, Russia, India and China, among others, enforce strict laws that make life hard or impossible for civil society organizations. Since the 1990s, international networks have formed to link organizations of smallholders, indigenous peoples, fisherfolk, farm workers and other rural groups. They try to influence the agricultural and food policy at the United Nations level. Some 22 international and regional umbrella organizations have joined forces in the International Planning Committee for Food Sovereignty (IPC). 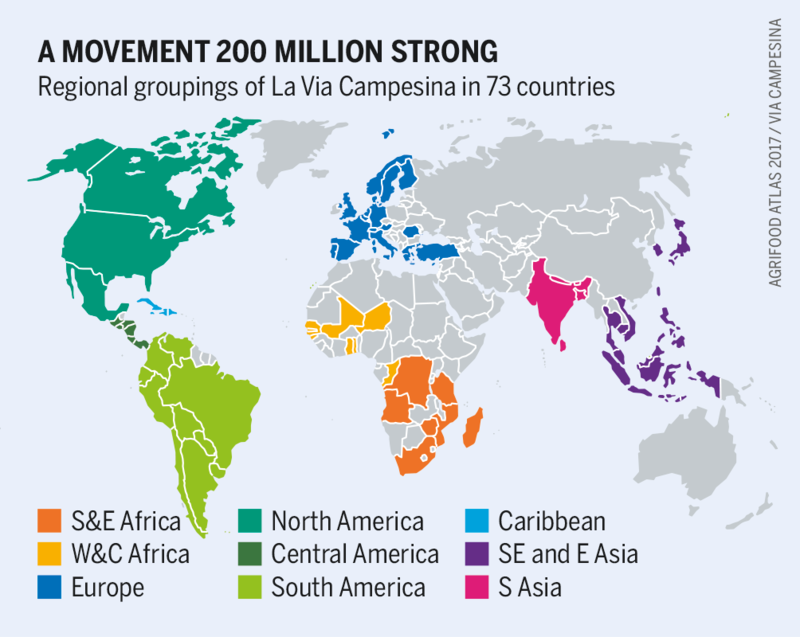 The biggest and best-known, with around 200 million farmers from more than 160 organizations in 73 countries, is La Via Campesina, Spanish for "the peasant way". 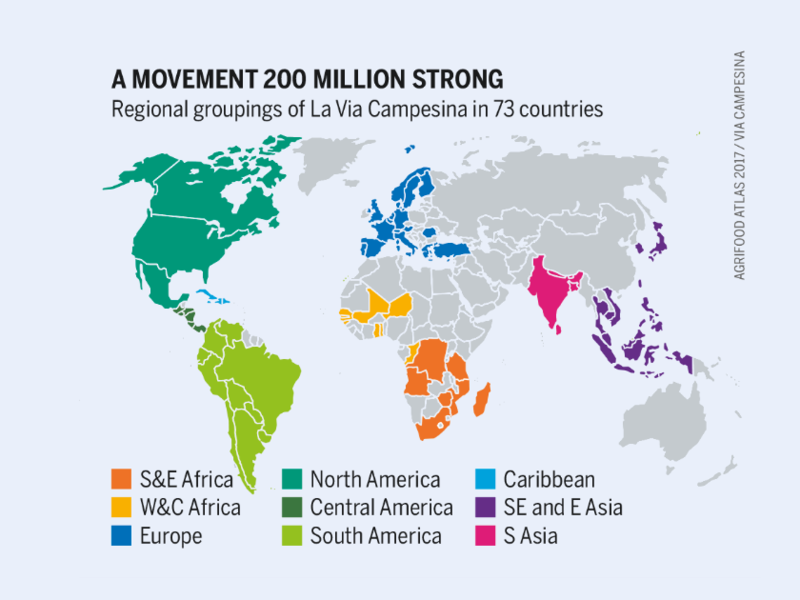 Via Campesina emphasizes food sovereignty and the central role of women in agriculture and food production. It is represented in international policy forums such as the Civil Society Mechanism of the UN Committee on World Food Security (CFS). The resistance to big agrifood takes on many forms and occurs at all levels. In 2012 in India, around 60,000 farmers and landless people held months of nonviolent protest marches in favour of land reforms. In 2007, other marches had gained the world’s attention and facilitated access to land rights for hundreds of thousands of people. Despite this, the promised land redistribution and investments are insufficient. European movements have been successful in their opposition against genetic engineering. As a result of their longstanding protests hardly any genetically modified crops and livestock are raised in Europe. A network of 170 genetic-modification-free regions prevents the introduction of such organisms, and fights against their spread on the political plane. Globally, and especially in the industrial world, NGOs, farmers, and internet platforms such as Avaaz, mobilise support, mount campaigns, organize demonstrations and launch petitions to exert pressure on governments and businesses. In Germany, the network Bauernhöfe statt Agrarfabriken ("Farms, not food factories"), a coalition of 250 citizens' initiatives, prevent 30 factory farms from being set up each year. All along the food chain, from production to processing and retail, workers are fighting against exploitation and for better working conditions. Workers on the Fyffes group’s pineapple and melon plantations in Costa Rica and Honduras protest against pay levels far below the minimum wage. They also resist threats and discrimination against union members, the blocking of collective wage negotiations, and the lack of protection against toxic pesticides. Local workers' representatives demand the right to organize and to conduct campaigns; they are supported by the IUF, a global federation of agricultural trade unions. Watchdogs such as the Corporate Europe Observatory constantly uncover cases of corporations trying to influence the distribution of farm subsidies, trade and research policy, and government research funding. Cooperation with whistle-blowers and independent media is vital to improve transparency and gain access to secret negotiations. Trade agreements and the associated rules that make it easier for corporations to expand their market control have also been a target for opposition in both Europe and America. Hundreds of thousands of people have demonstrated in favour of trade policies that impose rules on companies and guarantee people's rights. Millions sign online petitions. One such initiative signed by EU citizens called on the European Union to change its trade policy; it was rejected on technical grounds by the European Commission, a decision eventually overturned by the European Court of Justice. Resistance to free trade is not confined to the developed world. Imports of cheap chicken parts have almost destroyed poultry production in Cameroon. ACDIC, an activist group, launched a campaign against the "chicken of death" from Europe. It uncovered irregularities in importation and hygiene, and mobilized the media, politicians, consumers and farmers. Success took three years: in 2006 the government restricted chicken imports despite threats from the World Trade Organization. Consumers also organize themselves. The most successful campaign against a food multinational was to protest against Nestlé’s aggressive advertising for baby milk. 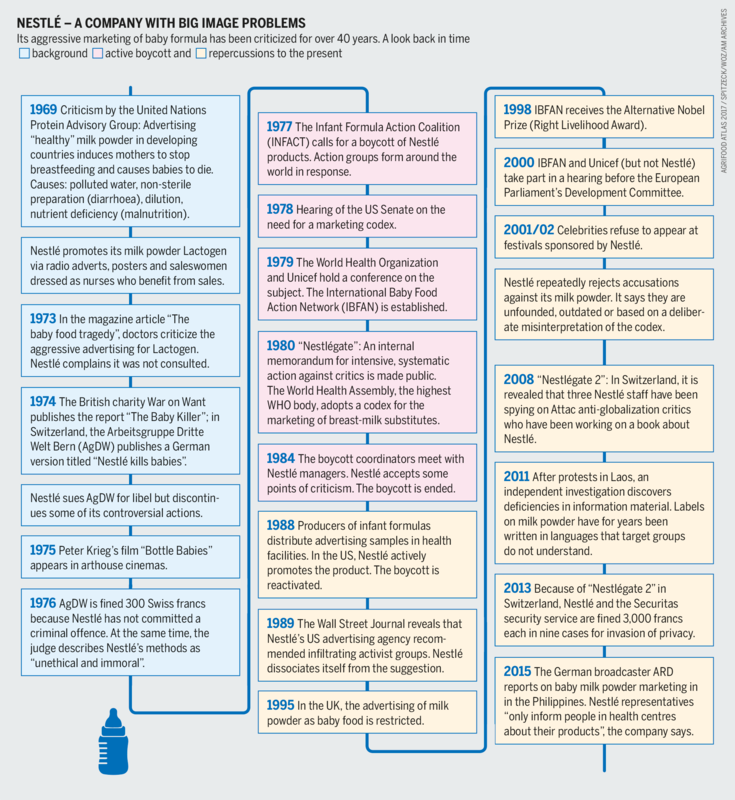 After a boycott lasting from 1977 to 1984, Nestlé finally changed its behaviour. A World Health Organization rule now regulates such marketing practices, and Nestlé's reputation is damaged to this day.